Brush your teeth, brush your hair, brush your…body? Yes, it’s time to add another important step to your morning routine. Dry brushing is not just a centuries-old health practice that’s been gaining popularity; it’s also an easy and effective natural beauty routine. The benefits of dry brushing are numerous, and go deeper than you might think. 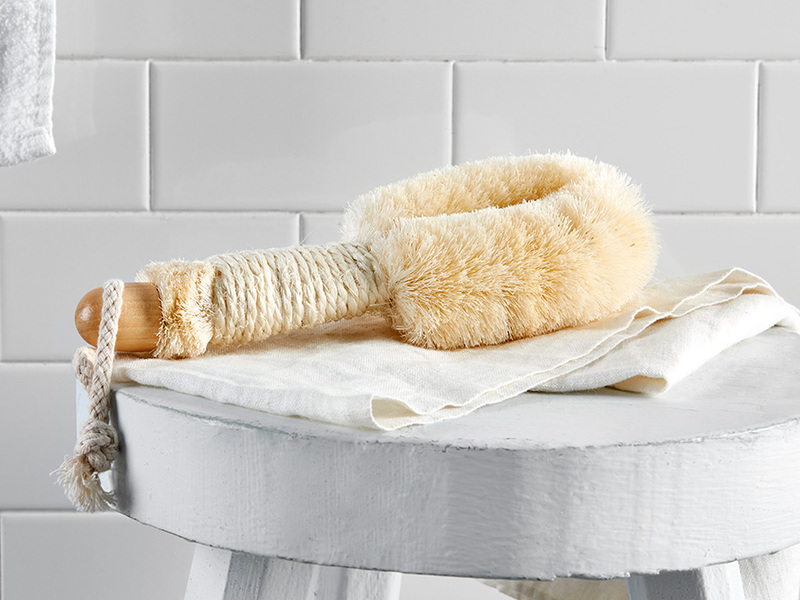 Using a body brush helps to shed dead skin cells and exfoliate on the surface level, which helps skin to absorb nutrients and retain moisture, thanks to clearer pores. But more than that, the technique can improve blood circulation and stimulate the lymphatic system, which is an important component of the body’s immune system. This can keep you in tip-top shape and may even help prevent illnesses. Some women swear by dry brushing to reduce cellulite. Since cellulite is made up of trapped fat cells, the ritual of dry brushing can help to release these trapped toxins and break them down, or at least reduce their appearance. The same goes for varicose veins. Now that you know all the fantastic, healthful reasons to start dry brushing, you’re probably wondering how it’s done. Don’t worry—it’s easy! First, you’ll want to choose the right brush. Look for a brush with firm, natural bristles (no synthetics or man-made fibers, as they can do more harm than good). The feel of the bristles should be stiff but not too stiff. Ideally, the brush should also have a long handle that’s easy to grip and hold. Next, you’ll want to make sure you are performing your dry-brushing ritual at the right time of day. Since dry brushing stimulates your senses and increases blood flow, it makes the most sense to do it first thing in the morning. We recommend hopping in the shower (water off!) and dry brushing right before you start the water to bathe. Start at the soles of your feet. Begin brushing with swift, firm strokes traveling from your feet up your legs, always brushing toward your heart area. Repeat brush strokes up your legs as many times as desired before moving on to your hands and arms. Grab a buddy if you can and have him/her help you brush your back, or do it yourself if you have a long-handled brush. Repeat as needed. Finally, brush your stomach, chest, and neck. Avoid sensitive areas or use a gentler touch there. Avoid your face altogether, as this skin is too sensitive for a traditional body brush. After your skin is nice and tingly, turn on the shower, and try alternating between very hot and very cold water to further stimulate circulation. Post shower, be sure to moisturize your skin with an all-natural body balm or coconut oil. Never dry-brush on wet skin—it won’t have the same effect. Don’t dry-brush over cuts, bruises, or sore spots. Start off slowly and gradually build up in intensity. Dry-brush daily for best results. When you’re not using it, store your brush in a dry, well-ventilated area. Wash it with warm water and mild soap once a week, allowing it to air-dry completely before stowing to prevent mildew or bacteria growth.